The second Ultimate Blast was held this past weekend at New York's Marriott Marquis Hotel - Grand Ballroom and we think it was even better then the first. Here we had the opportunity to taste some of the finest wines, cocktails and spirits in the world, with great music, excellent cocktail foods, and some really nice people all under one roof. The only real problem was not having enough time to experience it all. From our point of view it seemed like the after party for the Academy Awards of Spirits (click here to read a list of our product awards) . Not only did we get to rub shoulders with industry stars and leaders but we had the opportunity to talk with the press, have our products' picture taken and offer Heavenly tastings to a wide range of people and fans who really care. One of the highlights for me was when Paul Pacult introduced us to David Wondrich, who was there to sell and sign his newest book, "Punch." While looking at our line up of French products David noticed we had the French made Armorik Whisky and commented "I love that whisky." Being that I also love that whisky and value David's opinion, I immediatly asked him if I could quote him and he said "yes." So there it is for any of you whisky fans who who have yet to taste our wonderful French Whisky, made in Brittany, David Wondrich loves it. Come to think of it, we had people telling us all night how good it was, including Paul Pacult who has included it in his reknowned spirit seminars and that good looking woman who showed up late with Gregg Glaser, publisher of Modern Distillery Age. 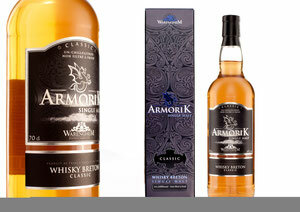 ArmoriK whisky will be showing off its new look in November. I hope the reaction to the new package will be as positive as the reaction has been to the new blend of this wonderful, easy to drink Whisky. See more photos here in our gallery or on our Face Book page. Cheers! We are just back from a very spirited tasting party in Chicago. 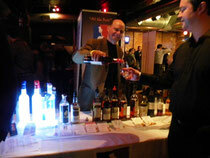 The Bottom Lounge played host to this first ever Independent Spirits Expo held in Chicago. The event showcased over seventy vendors including many of the smaller independent craft distillers popping up all over the US and around the world. Over five hundred people from both the drinks industry as well as consumers were in attendance. Heavenly Spirits was there showcasing some of our award winning products, including: Qino One Vodka, Delord Blanche Armagnac, Artez Pear Eau de Vie, Armorik, Single Malt French whisky, Roger Groult Calvados Pays d' Auge, Marie Duffau Bas Armagnac Napoleon & Hors d' Age, Dartigalongue Bas Armagnac XO & Hors d' Age, Delord Bas Armagnac 25 year old, Jean Fillioux Cognac Grande Champagne Cep, Jules Theuriet Cremes de Cassis and La Muse Verte Absinthe. During the tastings we had a chance to talk with a lot of interesting folks who came to our table with a wide range of spirit tasting experiences. I think it is safe to say we offered one of the broadest tasting selections at the event and were pleased to receive many compliments of high praise for the quality of our products and portfolio. Following this event Christine and I took the opportunity to spend the next two days visiting some of the outstanding on and off premise accounts in the Chicago area, where we conducted custom tastings for owners and staff. Chicago is a fantastically cultured city that continues to be one of our best markets due to their appreciation for exceptioal quality French spirits. This week, Heavenly Spirits traveled to Georgia to participate in Quality Wine & Spirits' annual tasting event. Always a first class affair, and regarded by vendors and clients as the best distributor show in Atlanta, this year was no different. 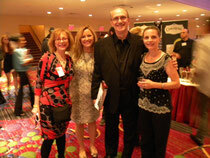 Retailers even came from neighboring Nashville, TN to taste the vast selection of wines and spirits. Held at the renowned Gift Mart Convention Center of Atlanta, Quality also supplied a tasting of fancy foods including crab meat, oyster, lobster, scallop, and cheese creations, for those who were in attendance. Heavenly Spirits was showing Whisky Armorik, Armagnac Marie Duffau, & Dartigalongue, Calvados Chauffe Coeur, Delord Floc, La Muse Verte Pastis and Absinthe. Joe Best is the owner of Quality Wine & Spirits. The VP / Purchasing Director is Bill York. Lindy Colburn is the Manager of Spirits & Mixology. Stay tuned for upcoming tasting events for Heavenly Spirits in Chicago, New York and elsewhere. One of our favorite on-premise accounts is La Voile Restaurant. http://www.lavoileboston.net Located on Newbury Street in Boston, La Voile offers classic French cuisine in a comfortable and convenient location. Our products find a perfect home at La Voile include: Armagnacs; Delord, Chauffe Coure, & Marie Duffau, Cognacs; Seguinto, & DuPeyrat, Calvados; Chauffe Coeur & Groult, Pastis La Muse Verte, and Qino One Vodka, the super premium French vodka brand Christine and I created and introduced in 2007. While the Heavenly Spirits portfolio has distribution in over twenty states, we are our own distributors in the state of Massachusetts. Due to the amount of time that is required to adequately keep up with each account we concentrate on servicing only about thirty off-premise retailers and less than a dozen on-premise restaurants or bars in the state. Restaurants and bars can be particularly demanding costumers that often need last minute inventory at difficult travel times. We appreciate La Voile for always being considerate when placing orders, allowing us a fair amount of flexibility to deliver on time. 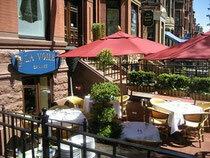 The next time you are in Boston looking for genuine French cuisine visit La Voile and tell them Heavenly Spirits sent you. Held every other year in Bordeaux, France, VinExpo is the largest trade show of wine and spirits in the world. The 2009 edition was the first CC and I had missed since 1995, so it was great to be back this year. We had a full schedule of meetings with mostly great news to report to our producers. We arrived Monday evening to attend a BNIA sponsored event featuring Armagnac in many forms accompanied by some fantastic regional foods. One great discovery I made (though it might seem obvious to some) was how fantastic a good Armagnac (or Cognac) can taste when served on the rocks in a whisky glass in place of a scotch before dinner. I strongly recommend all you scotch drinkers to try it some time. Regional cuisine samplings included; probably the best smoked salmon I ever had, marmite de brandade, fresh oysters and some fantastic desserts. In addition to the fine food, a cigar maker from Gascony was showing off his craft and handing out free samples. In attendance at this soiree were most of the Armagnac industry's biggest and most prestigious importers and producers as well as some top sommeliers and industry writers some of them shown in the photo gallery below. As the top importer of Armagnac in the US, Heavenly Spirits was happy to have the opportunity to hang out and party with this hard working group. The following two days were taken up by meetings with our producers and discussions of finding even better ways to serve American consumers of exceptional French spirits. We also had an opportunity to walk through what seemed like miles of exhibition halls that featured an amazing aray of the worlds finest wines and spirits. During this walk we spoke with some of the producers of products we might consider adding to our portfolio. The only word I can say about this right now is "aperitif,"... and boy are there some delightful products available that most Americans have never even heard of. Hopefully we will have more to report on this subject very soon. I will write more about the events and happenings stemming from VinExpo in later installments, but for now I'll just post a few photos and wish everyone a fantastic Summer. Feel free to contact us via email with comments and suggestions. Cheers! Click here for VinExpo 2011 Photo Gallery. 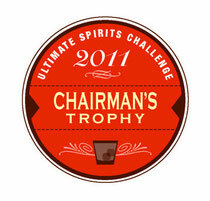 The 2011 Ultimate Spirit Challenge results were released almost a month ago and I am glad to finally have the chance to share the good news with you on this blog. Submitting our products to the Ultimate Spirit Challenge helps to assure us and our clients that quality remains our top priority. The purpose of Ultimate Spirits Challenge is to identify, recognize and reward those products which stand out in their respective categories, showing superior quality. Multiple panels of the highest-qualified experts blind-taste each entry by classification in appropriately grouped flights within each major spirits category, scoring each on the 100-point scale. Products that scored 90 points or higher are then evaluated blind once again, in newly-created groupings by a different panel of judges. Top scoring products were then reviewed again to determine a select group of finalists with the category’s highest-scorer being awarded a Chairman’s Trophy accolade. We are very pleased to announce that all the products we submitted to the USC this year did exceptionally well with a few that scored at or near the top of their respective categories. It was another whirlwind trip to New York, but well worth the trouble as we participated in the Annual VOS Grande Tasting event held at the City Winery. As usual it was a great opportunity for us to show and talk about our products to a wide range of people including retailers, restaurant owners, and many of the VOS sales staff who handle the Heavenly Spirits portfolio. We also had the opportunity this year to talk with some folks from the media like Gregg Glaser of Modern Distillery Age www.distilleryage.com. If you are in the spirits industry and have not yet seen his on-line PDF magazine you really should. The articles are relevant and the design is clean and up-beat. We also got to talk with Anaïs Digonnet a journalist who writes for the publishers of France-Amerique magazine and Marie, a representative from FRANCE Today magazine. 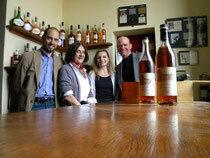 Of course you could not be in NY talking about Armagnac without May Matta Aliah (In The Grape) dropping by. In this case we happened to find her talking with one of her former wine students. All in all it was a very worthwhile but somewhat exhausting trip as we drove home to Massachusetts that same night. See more photos in our gallery here. This past weekend, Heavenly Spirits participated in a wonderful new tasting event sponsored by the MIT Club of Boston at the Royal, located just around the corner from where BLUE MAN GROUP perform. Ivy+ Fine Spirits was an opportunity for MIT Alumni and Grad students to taste some of the finest spirits available in New England while helping to raise some funds for the MIT Club and over $1,400 for Mothers Against Drunk Driving. 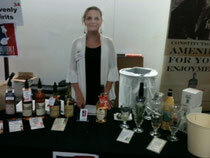 We were one of only 28 spirit vendors invited to showcase our products and the only one specializing in French imports. Federal Wine and Spirits was the official retailer who made it possible for anyone to order any of the spirits they tasted. The response was phenomenal. From the moment they opened the doors to the sold out crowd of almost 800 we had people standing four deep in front of our table for the opportunity to learn about and taste our products. 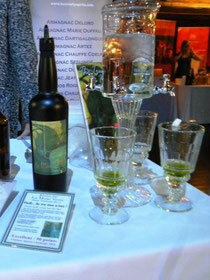 One of the top attractions for our table (and for the event I was told) was our La Muse Verte Absinthe. Perhaps it was because we had the traditional absinthe fountain set up and filled with fresh ice water that we slowly dripped into the glasses of La Muse Verte. Folks were allowed to taste it with sugar or without. This very learned crowd wanted to know everything about the history of absinthe and so I obliged as best I could by putting on my college professor hat and telling them everything I knew. Apparently the word spread that we had something more than quality products because folks kept showing up at our table demanding to hear the whole story of absinthe. 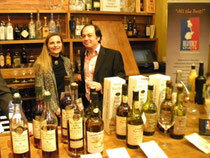 They also had questions for Christine about Armagnac, Cognac, Calvados and Armorik, our French made whisky as well. The event ended promptly at 6:00 PM and due to a system of limiting the number of tastings to ten per person everyone seemed to safely walk away with a smile on their face and a glow in their heart. In fact I didn't even see one person who got totally Charlie Sheened, and that is a good thing. Congratulations to Kevin McComber and his team for doing such a fantastic job organizing this fine event. See our photo gallery for more images of the event. This superb single malt, double distilled whisky made from 100% French malted barley is the first of its kind to be produced in France. Twenty-five years and several prestigious awards later Armorik has found its way to American shores and we at Heavenly Spirits are thrilled to be the exclusive importers for the US market. This exceptionally well made whisky has everything a seasoned scotch or bourbon drinker will love, including a lightly floral aroma, a soft and honeyed entrance followed by a well balanced touch of spiced wood and citrus, and ending with a lightly smoked and pleasantly peaty finish. Armorik is the result of a very unique aging process, using a majority of refill bourbon casks made from American white oak and finished with some refill sherry casks made of Spanish oak. 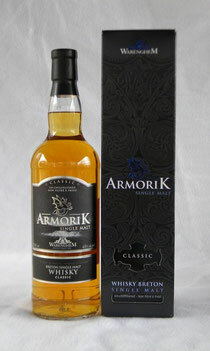 Jim Murry's 2010 Whisky Bible awarded Armorik 91 points. As we are just beginning distribution, please contact us for availability in your area.